Prices and estimates of works Les Mcdonald Jr.
Arcadja Auctions > Artists Database > M > Mccu-Mcel > Les Mcdonald Jr.
Find artworks, auction results, sale prices and pictures of Les Mcdonald Jr. at auctions worldwide. 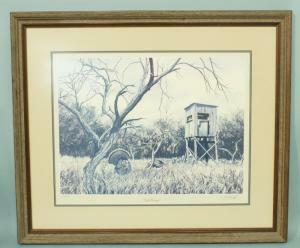 Some works of Les Mcdonald Jr.
LES MCDONALD JR. "SAFE PASSAGE" SIGNED AND NUMBERED PRINT, EDITION NUMBER 34/900, 1990. Height: 29 and 19 in. by Width: 34 and 24 in.